Alhazen or Abu Ali al-Hasan ibn al-Hasan ibn al-Haytham was an Arab polymath born in the tenth century AD. Popularly known as the first scientist, Alhazen developed the scientific method of experimentation and was the first person to formulate hypothesis and conduct verifiable experiments. He was a scientist, philosopher, astronomer and mathematician and made major contributions to the field of optics. He is sometimes called Al-Basri as he was born in the city of Basra in Iraq. Alhazen was a devout Muslim and studied theology at first. He also trained to work as a government official and worked as a minister for some time. However, he was soon disillusioned with the conflicts between the Sunni and Shiite sects of Islam and turned his attention to science. He studied the works of the ancient Greek philosophers such as Euclid and Archimedes, but his overarching belief was always in the perfection of a higher spiritual power and the flawed nature of human beings. Alhazen lived during the Fatimid caliphate, who were the descendants of Prophet Muhammad. He moved to Egypt for a short time during the rule of al-Hakim, who was known as a cruel and exacting ruler but a staunch patron of the sciences. There are conflicting accounts of Alhazen’s life; one version of his biography states that he had made a claim to the caliph that he could use his scientific knowledge to regulate the flooding of the Nile. However, his attempts at doing so were futile and so fearing the caliph’s wrath, he feigned madness and was placed under house arrest for the remainder of the caliph’s life. He was only released 10 years later, upon the caliph’s death. During his house arrest he conducted experiments and strengthened his knowledge. Alhazen’s scientific knowledge was extensive. He wrote over a hundred books, more than half of which have been preserved. One of his most influential writings was in the field of optics. It comprises seven volumes and is known as “Kitab al-Manazir”. It was translated into Latin in the 13th century. Roger Bacon read Alhazen’s works and summarized it in his own book called “Opus Majus”, or “Greater Work”. In his book, Alhazen gave experimental proof of the nature of light, the structure of the eye and the basic principles of reflection via mirrors. Alhazen’s theories of vision contradicted the existing knowledge of the field as suggested by Ptolemy and Euclid. He stated that contrary to popular belief, the eye does not send out rays to the object it beholds, rather it is the light reflected via the said object that the eye beholds. 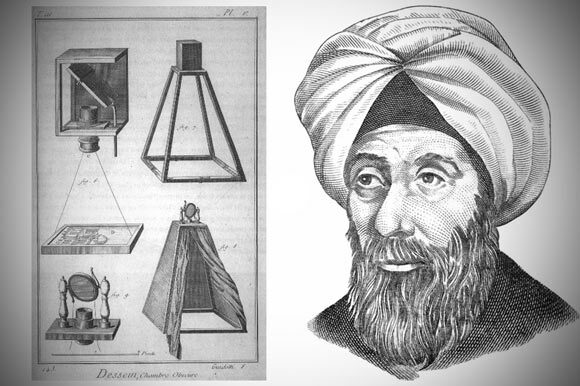 Alhazen made major contributions to physics, mathematics and astronomy as well. He developed the field of analytical geometry by exploring the connection between algebra and geometry. He studied the atmosphere and deduced the relationship between its density and height, which according to him was 55 miles. He devised one of the first laws of motion and suggested that an object in motion will remain in a perpetual state of motion unless it is influenced by an external force that causes it to stop or change its direction. In astronomy he studied the anomalies between Aristotelian and Ptolemaic models and wrote his own treatise called “On the Structure of the World”. Alhazen was undoubtedly one of the finest and earliest Muslim scholars of note and his work influenced many notable scientists and scholars who came after him such as Leonardo Da Vinci, Galileo, Descartes and Kepler, to name a few.